The rattan indoor furniture is one of the most famous additions to the modern house. Although rattan can be used for both indoor and outdoor, we will focus on the indoor this time. The rattan indoor furniture looks very astonishing and attractive. It does not only give such warm feeling for the guests of the room, but also cozy feeling. After adding your living area with the rattan indoor furniture, you will have sensible reason to return home to relax and refresh your mind. The rattan pieces are durable, practical, compact, and versatile. When it comes to practical and aesthetical aspects, you can’t go wrong with the rattan indoor furniture. At WISANKA Indonesia Rattan, you will notice that it comes in variety of sizes, colors, and shapes. There are plenty of styles which can be complemented with the rattan. Rattan is naturally beautiful. Its flexibility allows you to fit this with any design at your home. the rattan indoor furniture has been the great choice because of its unique way to blend in the living area in your home. The rattan for wicker is stronger and more durable than other fibers. When it comes to the customized furniture, you can rely on the work done by WISANKA Indonesia Rattan. The desired piece of furniture will come as you request. The rattan wicker furniture is a great way to amp your room up. Whether it is your bedroom, living room, dining room, playground, kids room, rattan can serve the purposes well. It is more durable than other natural fibers. When it is used for outdoors, it can withstand the natural forces and outer elements. Imagine how much effective it is when you add this to your indoors. The rattan indoor furniture can maintain its natural color, shades, and shapes. It has the flexibility to blend in. So if you have existing furniture pieces at home, you can’t go wrong when adding the rattan indoor furniture. The existing design in the room can also work well with your rattan indoor furniture. The natural color of the rattan indoor furniture is the winning point that you may not find in other furniture. You will be able to mix and match it with the existing design of your room. It is also very easy to maintain the furniture. The easy dusting can be done regularly to maintain the surface of the rattan. When there is spillover or other disturbance, you could clean it with the mild detergent and lukewarm water. For occasional treatment, you could just wash it with mild detergent once or twice per year. It is a high-end furniture which can be used both indoors and outdoors. For indoors uses, the ages of your furniture may be longer than you and your children when it is properly treated. 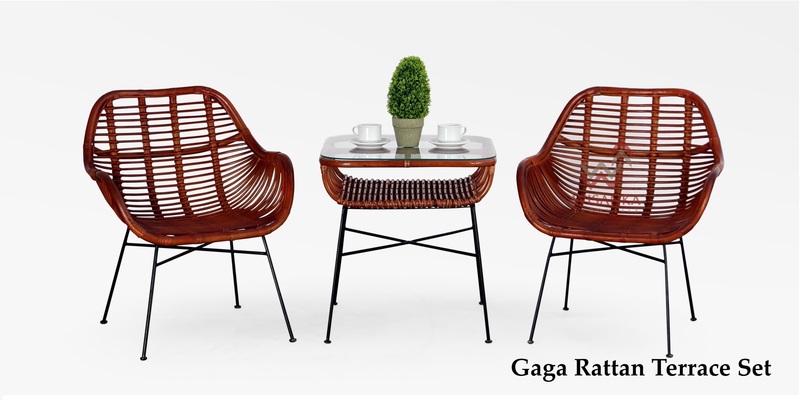 Because of the natural beauty and unique characteristics of the rattan, it has been the top choice for many people. The rattan indoor furniture is durable and long-lasting. The pieces from rattan provide the exquisite and unique experience for the users. That is also the reason why the hospitality businesses often use rattan furniture for their properties. It also has such high traditional value. Considering all the options, you will want to use the rattan materials for your indoor area. Many people purchase the furniture for the aesthetic purpose without thinking about the functionality. With the WISANKA Indonesia Rattan manufacturer, you can have the perfectly balanced furniture in terms of practical and aesthetic factors. The rattan indoor furniture is indeed amazing and reliable. This looks stunning when housed in different areas in your home. Not to mention that it will last fairly long. However, not all the rattan pieces sold in the market are created equal. There are some manufacturers who overlook the quality of the furniture by using fake fibers. WISANKA has higher standard in which the manufacturer only focuses on the high grade materials to uphold the quality of deliverance. The real things are always better, including the rattan furniture. The real rattan indoor furniture can withstand the weather and last longer. These also do not absorb moisture so that you can notice that the furniture will appeal maximally on daily basis. You can also blend the indoor and outdoors as you wish since rattan looks very natural. Not to mention that despite the strength, it is lightweight. So in case you want to move your chairs to your terrace, you don’t have any difficulty to do it. You can also use your indoors furniture for the outdoor activities temporarily. Rattan is pliable, which makes it more flexible to cater the specific needs of the client. The pliable characteristic of the rattan allows the manufacturer to transform the rattan material into different shapes and designs. That means WISANKA is able to customize the rattan furniture as you desire. You just need to reach our creative team to discuss the ideas in your mind and together we will actualize it. The rattan indoor furniture is a great addition to the living area which is made for heavy use. For instance, you often invite the guests to your house and have a quick BBQ party on your patio. You can then move your living room rattan chairs to outside for this purpose. Knowing that it is sturdy and strong, you won’t have to hold back when using them. The lightweight furniture will help you a lot when it comes to arranging your room. In case you are bored with the current furniture arrangements, you can easily move around the furniture to see which new arrangement that can work now. The rattan indoor furniture requires low maintenance, which will give you more perks in the future later. That means you won’t need to waste your time and energy to treat the rattan furniture. For the minor maintenance, you could use the usual household items to maintain it. For the major maintenance, you will just need to wash it lightly. It is also a great solution if you are on the tight budget but need to add more furniture pieces for your resort. WISANKA also offers the wholesale rattan indoor furniture in better prices. What are your reasons to choose Indonesia Rattan wholesale? Find Your Suitest Rattan Wholesale Items to Meet Your Desire Here.